Happy New Year Jersey City! Here's what's happening in Jersey City on New Year's Eve and New Year's Day. Union Republic is hosting an 8 course dinner that will, in a refreshing change of pace, not have a DJ. Liberty Prime Steakhouse has three seatings available over the course of the night for $75-95/person which includes live music and a four course dinner. The Kitchen at Grove Station is temporarily closed. They will be reopening in 2016 under the same name and management with a new executive chef and kitchen staff. After less than two months open, Bell + Gray has permanently closed their doors. The Citizen is hosting a Bernie Sanders Fundraiser Show on January 2nd. The Riverview Farmer's Market is raising money to help purchase a portable PA system for use in their Music in the Park series. Walking into Dolma, I could immediately tell that this restaurant would be special. It's not very large, seating approximately 20-25, but sunlight streams through the windows and the space is bright but calming. It's a clean aesthetic, but cozy with a few touches of old world Mediterranean charm. From the same owner as Two Aprons, Dolma, 270 Grand Street, opened up a couple months ago, initially serving weekday lunch and more recently adding a weekend brunch. They'll also soon be adding in dinner, but in a move I personally can appreciate, are moving slowly, making sure the service and menu is under control and that they're fully prepared. The attention to detail and emphasis on good service is immediately apparent and for a fairly new restaurant, it appears to be running almost seamlessly. I was blown away by the easy, relaxed attitude of the servers and staff and the quality of my whole experience. Feed JC is holding their annual Christmas Clothing and Food Drive where they will be spending Christmas Day delivering clothes, food, and care packages to over 400 of Jersey City's less fortunate. Tomorrow is the last day for the HDSID Grove St. Farmer's Market which also marks the last official day for Farmer's Markets in Jersey City. Swing by, stock up, and say goodbye to your favorite vendors for the next few months. Milk Sugar Love has some ready-made treats at the store including frosted and decorated holiday cookies, bourbon sea salt caramels, and bags of decadent caramel popcorn with chocolate drizzle and salted peanuts. L'Atelier Du Chocolat is the perfect place to stop for a last-minute gift for almost anyone with their high quality chocolates, exotic flavors, jams, and really, what better way to say Happy New Year than with a box of champagne truffles? For all those in Jersey City who have lamented the lack of a good fishmonger downtown (which seems to be just about everyone), your wishes have finally come true. It's a brand new week and what better way to kick it off than with two new eateries in Jersey City officially opening up soon? Congratulations to The Grind Coffee Shop in Bergen Lafayette who started their soft opening this past Saturday and will be officially open beginning tomorrow (12/14). Thirsty Quaker has put together a special Christmas Gift Guide showcasing great gift items from their store. Cocoa Bakery has officially released their holiday menu and have started taking orders. This Saturday and Sunday is the JC West Side Craft Fair at the Gallo Center in Lincoln Park! 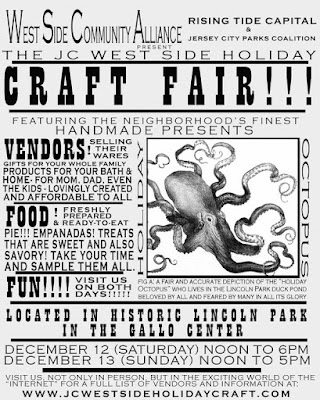 There will be lots of small local vendors selling everything from natural dog treats to ceramics to handwoven apparel. And most importantly (because this is a food blog) there will be some great eats and some great food gifts! Sam a.m. is celebrating the holidays with 12 Days of Donuts and there are still 11 days left. Greene Hook updated their website and added their menus. The Big Straw has announced two new flavors for winter - Ginger Honey Jujube and Red Bean Black Sesame. The Jersey City Project is back again with their third annual Project: Market this Saturday and Sunday from 11am-6pm behind City Hall. While this particular market focuses on vintage and hand-crafted goods for the holidays, there's still plenty of good eats to enjoy and it's the perfect spot to pick up a few food-related gifts for the obsessed eater in your life - or just some good host/hostess gifts. 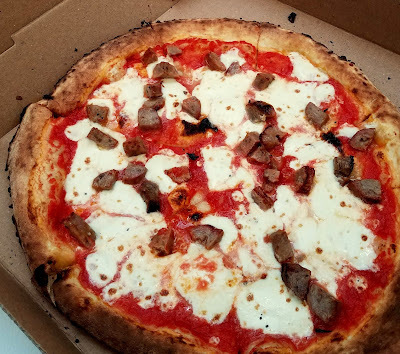 A new paleo delivery service, Graze and Braise, has started up in Jersey City. Created by Ayaz Adiguzelli, Graze and Braise follows the structure of a paleo diet - organic, grass-fed, pasture-raised, free of refined sugars and oils - but uses these ideals to create paleo-friendly versions of comfort foods. They offer salads, soups, entrees, sides, and desserts, all on an on-going basis and with a heavy focus on high quality proteins.